After a wonderful Friday night out with our newly married friends, I awoke to a cold and gray Saturday. It was one of those days when you look outside you just don’t feel like doing anything. It had already been quite a crazy week for us with the snow storm on Wednesday. I ended up having the day off and spent it enjoying some beers and watching the snow fall outside McSorleys. Needless to say my midweek drinking binge and a night out with friends before had completely zapped me of energy. We decided to cancel our usual weekend events of errands and went to a movie instead. We trekked up to Times Square and saw Avatar at Empire 25. I had low expectations for the movie and ended up really enjoying it. It was the perfect way for us to relax for a few hours. Since we were already in the area, we stopped over at one of my favorite bars in the world Jimmy’s Corner for a drink and some jazz music. I had been craving a burger all day and when I realized we were only one block away from HB burger it seemed like a no brainer. HB burger got a lot of press last year when it first opened up. 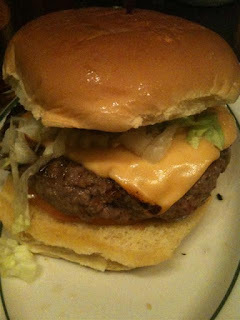 Many of the NY food critics put it up there in the ranks of Shake Shack and PJ Clarks. Would it live up to it’s reputation? We were about to find out. We walked in right around 6:00 and got one of the last tables. The space was big and reminded me of all of the other Heartland Brewery’s I’d been to before. Our friendly waitress took our order and within minutes the food arrived. I went for the classic HB burger with American cheese. Each burger comes with lettuce and tomato on a potato roll. Picking up the burger I was surprised how heavy it was. It was a decent size but I wasn’t expecting the weight. Maybe it was so heavy because of what was inside- the fricken huge amount of juice! Oh my lordy! Look at these moist innards. Within two bites of this burger I was covered in freely flowing juicy goodness. There was juice all over my hands, down my face and so much so that I needed to ask for more napkins because the two I had were soaked through. I was a mess…but a very happy mess at that. This burger was great. It had a nice char on top and the potato roll was a squishy perfect casing for the insanely juicy beef. The bottom of my roll became completely soaked through but somehow managed to stay together. In my mind this was a great burger but two things could make it even better. One, add a little more salt to the outside. The char was nice but it could use a little bit more so the outside has a crisper exterior. Two- add a pickle or serve it plain. I my opinion burgers need all three or nothing at all. 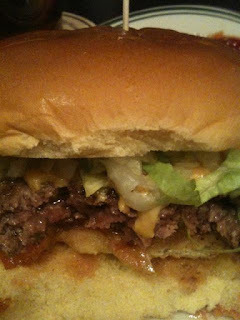 I truly missed the pickle on this burger and ended up taking off the lettuce and tomato half way though. Maybe I’m a weirdo but that’s the way I think a burger should be. 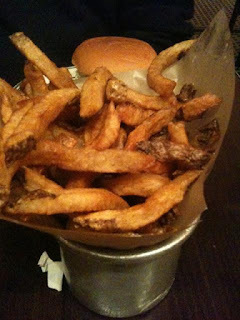 The fries were okay- they didn't come with the burger- they're extra. I would probably try the tater tots instead next time. That being said, I really truly did enjoy this burger. Is it up their in the rankings of Shake Shack and PJ Clark’s? I wouldn’t go that far, but for only $7.50 in the Times Square area`this is truly an affordable and delicious dinner.